Select your Size & Fabric or for assistance, call toll free 1-800-791-7144. If you don't see your model number listed above, just measure the entire length of your piano, from in front of the keys to the furthest point at the back curve. This piano cover is just beautiful. I really had no idea of how nicely it would turn out. I could have made my own cover but chose to have it custom made. I am really pleased with it. Even the side slits were very nicely done and not real noticeable. The black fabric has a nice sheen to it. I am not at all embarrassed to leave this cover on my beautiful grand piano. A great buy. I bought this cover to protect my piano from my intrepid cat, who climbs everything. The cover fits my piano to a T, looks great in the living room, was affordable, and arrived in much less time than it would have taken me to make a cover myself. I couldn't be happier and would highly recommend a similar cover to anyone looking to protect their piano from dust, scratches, and pets! I found the piano cover to be of excellent quality and surpassed my expectations. The thickness of the padding well protects my piano from household pets and other potential mishaps. The cover itself is attractive and does not detract from the room decor. I was also very happy with how quickly I received the item in the mail. Thank you! The service I received from Vanda King's, as well as the quality of workmanship, is top-notch! Correspondence between myself and the Vanda King representative was quick, clear, and the timeliness of the piano cover being shipped was very appreciated. Great company and a great product! I was very pleased with my purchase of the piano cover. 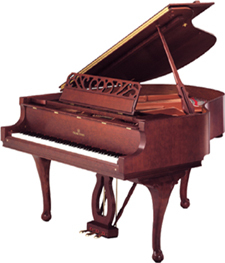 It was so nice that you had covers for specific models and makes of pianos. I was able to correctly measure the instrument and it fits like a glove! Thank you so much.